The deaths of 74 militant soccer fans in a politically loaded soccer brawl in the Egyptian Suez Canal city of Port Said has political forces across the country’s political spectrum scrambling to score points and counter a tsunami of rumours as security forces appear to have gained the upper in days of clashes with ultras and youth groups near the interior ministry in downtown Cairo. With the military and security forces accused of at best negligence and at worst having deliberately instigated the violence that led to the death of the fans immediately after last week’s match between Port Said’s Al Masri SC and crowned Cairo club Al Ahli SC, businessmen associated with the regime of ousted President Hosni Mubarak and fundamentalist Salafi politicians who advocate Islamic practice as it was at the time of the Prophet Mohammed in the 7th century are being drawn into the maelstrom. Yasser el-Mallawany, the chief executive of EFG-Hermes, the Arab world’s largest privately owned, London and Cairo-listed investment bank, denied allegations that he had funded an unidentified group of thugs who reportedly had mingled with the Al Masri fans and instigated the violence that led to the 74 deaths. Al Masri fans said they had noticed a group of people in the stadium that they had never seen before. The allegations were reported after Mr. El-Mallawny was barred from boarding a flight from Cairo to Dubai on instructions from Egypt’s attorney general. Associated Press quoted a justice ministry official as saying that Mr. El-Mallawny was together with Mr. Mubarak’s imprisoned son Gamal, whom he was grooming as his successor, being investigated for having paid the thugs to attack the Al Ahli ultras. The ultras played a key role in toppling Mr. Mubarak and have since been the most militant thorn in the side of the military that succeeded the ousted president with a promise to lead the country to democracy. Mr. El-Mallawany was a member of the policies high committee of Mr. Mubarak's National Democratic Party. He said he was on the committee to "give ideas regarding the technical issues of finance". Sources close to EFG-Hermes said Mr. El-Mallawny was among 300 people barred from leaving Egypt because of their alleged ties to the ancient regime and corruption but that it had nothing to do with the incident in Port Said. Gamal Mubarak is believed to have an 18 percent stake in one of EFG Hermes’ numerous subsidies, EFG-Hermes Private Equity that contributes an estimated 7% per cent to the bank’s total profits. EFG-Hermes has denied managing any funds or portfolios for Mr. Mubarak or members of his family. “No charges of any form have been laid against Mr. El-Mallawany. The firm has been informed that the ban was issued as a precautionary measure, as similar bans have been imposed in the past 12 months on other individuals in Egypt,” EFG-Hermes said in a statement. EFG-Hermes has offices in Egypt, the UAE, Saudi Arabia, Qatar, Oman, Kuwait and Lebanon and employs more than 850 people. It has advised companies such as Vodafone, Sainsbury and Heineken on deals in the region. At the very other end of Egypt’s political spectrum, Sheikh Abdel Moneim El-Shaha, a controversial Salafist preacher, was attempting to talk his way out of reports that he had condemned soccer as a sin and said that the 74 ultras were killed because they had been watching a forbidden form of entertainment. Mr. El-Shaha charged that he had been misquoted. He said that while he considered soccer a sport like swimming, archery and horse riding that was encouraged by Islamic law, he objected to large sums of money being spent on the sport instead of on youth centers. Mr. El-Shaha however did little to correct the impression that he was in-line with hard-line Salafist beliefs that condemn soccer as a game of infidels with his refusal to acknowledge the 74 dead ultras as ‘ash-shuhada’ or martyrs, an Islamic and Arabic term used to describe among others those who died in innocence. The families of the 74 describe their lost ones as martyrs. "What I said exactly was that not everyone who died unjustly is a martyr. And the people who died in Port Said died unjustly and no more. In sharia (Islamic law), a martyr is someone who died in battle or dies a painful death, drowns, or dies under the rubble of a building. 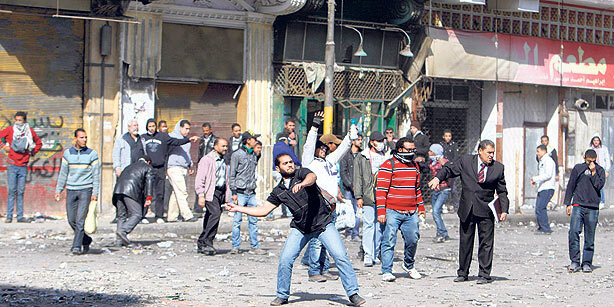 But those who died in Port Said only died unjustly," Mr. El-Shaha told Al Arabiya. Mr. El-Shaha was quoted by Al Arabiya Asharq Al-Awsat and El-Badil as telling an audience in the El-Fath mosque in the Mediterranean port city of Alexandria, a Salafist stronghold, that the 74 died while watching an a forbidden sport that is alien to Muslims, distracts from praying to God and that had been imported from the West. “They were not in a war fighting for God, they were just having fun. This fun distracts Muslims from worshipping God,” Mr. El-Shaha was quoted as saying. Mr. El-Shaha’s comments are in line with the banning of soccer on the threat of execution by the Al Qaeda-affiliated Al Shabab militia, which controls chunks of war-torn Somalia, earlier remarks by Egyptian Salafi Sheikh Abu Ishaaq Al Huweni and a 2005 attempt by Saudi Salafi clerics to rewrite the rules of the game to allegedly Islamify it. “All fun is bootless except the playing of a man with his wife, his son and his horse… Thus, if someone sits in front of the television to watch football or something like that, he will be committing bootless fun… We have to be a serious nation, not a playing nation. Stop playing,” Sheikh Al Huweni said in a religious ruling published in 2009 on YouTube. Al Noor has yet to distance itself from Sheikh Al Huweini’s comments. Al Noor has also yet to take issues with views such as those expressed in 2005 in a controversial ruling by militant clerics in Saudi Arabia, the world’s most puritanical Muslim nation where soccer was banned until 1951. The ruling denounced the game as an infidel invention and redrafted its internationally recognized International Football Association Board (IFAB) rules to differentiate it from that of the heretics. It banned words like foul, goal, and penalty and like shorts and T-shirts and ordered players to spit on anyone who scored a goal. In Egypt’s political center, a parliamentary committee meanwhile blamed Interior Minister Mohamed Ibrahim for the deaths of some 15 protesters in the wake of the Port Said incident and called for a vote of no confidence in the minister. Outside the interior ministry security forces appear to have gained control of streets that were the scene of four days of pitched battles with ultras and youth groups. Leaders of the ultras have denied that they were involved in the fighting but admit that many of those attempting to storm the interior ministry are members of their groups who are beyond their control. The security forces gained the upper hand by using tear gas and bird shot after attempts to mediate a truce by clerics and activists had failed.